A Klingon spy on board the Enterprise has been passing secrets to the Romulans, and that invites a deep inquiry from Starfleet. 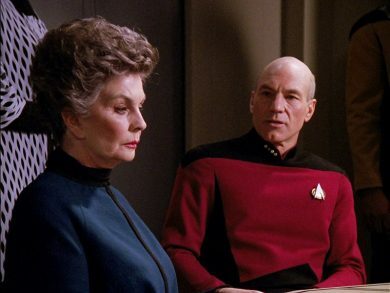 But when Admiral Satie shows up, the specter of conspiracy threatens to make enemies out of everyone – including Picard himself! The Drumhead in this week’s Mission Log.